The success of last year’s ‘Nottingham in Parliament Day’ was recognised last week at a black-tie awards ceremony in London. 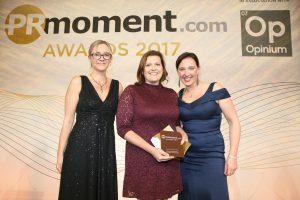 The University’s Political & Public Affairs Unit, who led the ground-breaking initiative, collected the PRmoment.com ‘Event of the Year’ award in recognition of the day-long celebration of all things Nottingham. Nottingham in Parliament Day – held on 25 October 2016 – saw over 100 organisations take over the Houses of Parliament for 45 different activities showing off the strengths of the city. From research showcases with Michelin starred chefs, GSK and Rolls Royce; to “Parliamentary Ping Pong” with Table Tennis England and Robin Hood – 3,000 guests, 140 speakers took part in a trail-blazing initiative with a media reach of 15 million that boosted Nottingham’s profile, highlighted Nottingham’s issues and celebrated Nottingham’s strengths at the heart of government. With over 800 entries, a jury session involving 93 judges and an awards ceremony attended by over 700 PR and communications professionals – the PRmoment Awards took place in London on Wednesday 29 March 2017. In the same week, the team learned the initiative has also been shortlisted for the ‘Education Communications Campaign’ award at the Chartered Institute of Public Relations (CIPR) Excellence Awards, and been put forward as a European finalist to the global CASE Platinum Awards for ‘Best Practice in Marketing & Communications’. Both awards will be announced in the week commencing 5 June 2017.